The Newest Rant: More Thoughts on Race and "Open Carry"
I wrote not too long ago about the concept of "Open Carry" and how it struck me as being inherently racist as all the open-carriers seemed to be white (and almost all male, but that would be its own article). My argument was basically that while a white man might be able to stroll down the street with an AK-47, if a black man did this the odds were he would have the cops called on him right away, and then instead of being ordered to put the gun down as sometimes happens with white open-carriers, a black man would just be shot. I mean, if recent events where a black man carrying a toy pellet-gun he wanted to buy got him shot-on-sight at a Walmart in Ohio, am I making that much of a logical stretch? My post caused a lot of comments to be made on my blog, something which surprised me as I barely get any views on political posts usually. There was enough discussion I made a follow-up post about the attention I, a relatively small presence on the internet, received for my article and what that could mean for bigger names who thought to question open carry. Some of the comments were dumb insults, and some were well-written and made me think. One thing that was repeated by some folk and made me really wonder though was if I needed to look harder to find those of other races who engaged in open carry. Black people do in fact open carry. It is a small demographic, but it exists. There is a group in Texas named the Huey P Newton (a founder of the Black Panthers) Gun Club that proudly open carries to protest police brutality towards black people. From what I've read about these sort of groups they are both useful to those who support open carry as they can say, "See? Other races do it!" but also worry them, because as this article points out, how long will it take a State such as Texas to enforce stricter gun laws once it becomes apparent it isn't just white people who want to walk around with their guns out? When you name your gun club after a famous Black Panther, it wouldn't surprise me if I shortly after a city or State you are located in makes open carry illegal. It sound strange, but California enacted tougher gun laws under then-Governor Ronald Reagan in response to the group known as the Black Panthers and how they would openly carry their firearms. 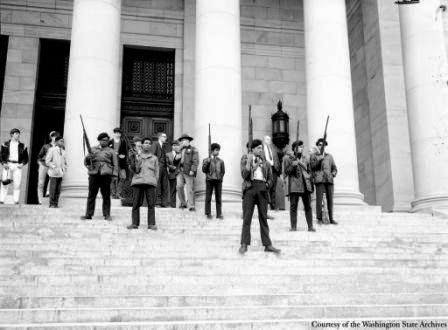 Known as the Mulford Act, it banned open carry and it was supported by the NRA back in 1967. Now here we are in 2014 and the very same organization is proudly proclaiming how open carry is a constitutional right, and I'm just here wondering if more Huey P Newton-styled gun clubs would change the NRA's tone. 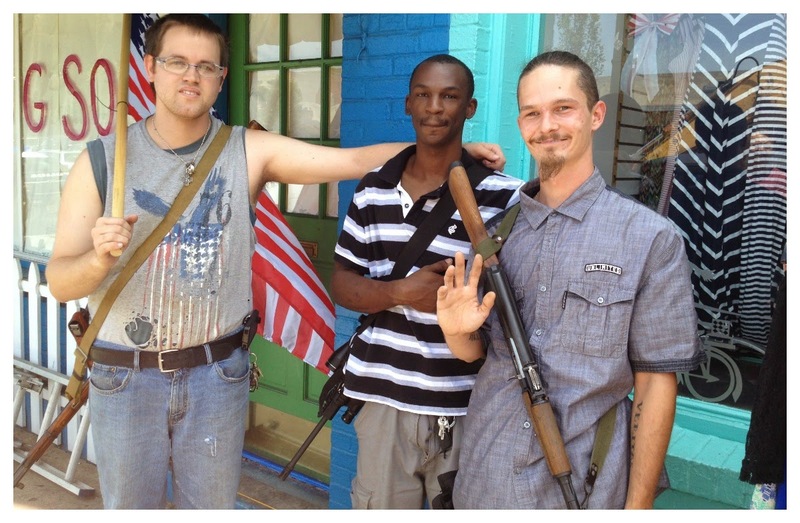 An open carry group with multiple races. I am by no means saying that white gun-owners are racist, I am saying that our society has its own issues with race that caused me to consider the initial question of why it appeared only white individuals would open carry. I have known white gun-owners who are loving of all races, but the organization of the NRA itself seems to often put-out racially charged messages that portray minority individuals as the dangerous "other" that guns are needed to defend oneself from. By digging deeper I have found that there are minority individuals who open carry, but at the same time as proving me somewhat wrong it could in the end prove me more right than ever. 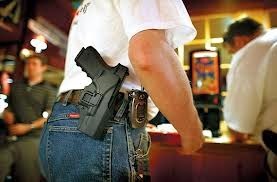 After all, if suddenly we see more minority individuals engaging in open carry than the small amount gun-organizations are comfortable with so they can claim diversity, and just as suddenly a strong effort begins to ban open carry by those who had at first supported it....well, would you be particularly surprised? On the flip-side, perhaps I am completely wrong, and those who support open carry along with the NRA will rejoice at these new demographics now open carrying. I actually wouldn't mind being proven incorrect, as it would show our society is moving into an era with less racial-conflict. Then again, look at Ferguson and tell me racism is a much more minor issue as I've heard claimed. Really, only time will tell where this all ends up going politically. We will probably see soon enough. OpenCarry is legal in 45 states (including California, a rural only open carry state). Learn more at OpenCarry.org. And carry on! Dude, the reason you see white people open carrying most of the time is because white people are between 65-70% of the population. Unless you live in a fairly large city, you're going to see a lot of white people. And this is openly racist. I'm not trying to argue with you about that, because it is just so. Everything you just wrote comes down to, "I wonder what white gun owners think about black people open carrying. I don't think they would like it"
We really don't care who is open carrying as long as they do it responsibly, and never use it unless to deter a crime. This article's purpose is to paint us out as bigots and racists. We're just people who have a desire to protect ourselves in the most efficient way possible when it is absolutely necessary. We're not stupid.